Remodeling will become much more expensive, starting April 22. Small contractors might as well close up shop now. Neo-neocon has the story, and the comments: Next on Obama’s hit list: small contractors. I can't recall another American President who thought that prosperity was a Bad Thing, and worked so actively against it. I think I have finally found the W.C. Fields movie I was looking for — and its name is "Poppy"
Cascading absurdities, grandiloquent orotundity (or should that be "orotund grandiloquence"), a "talking" dog, a shell game, a fair amount of booze, "Purple Bark Sarsaparilla," without which "this mundane sphere of ours would be barren, bleak, and dank," a pretty girl and a romance, a highly unlikely plot device, a carnival, a certain amount of conniving, not too much bitterness, and the closing line, a bit of fatherly advice to the dear adopted daughter who is about to go straight, "Never give a sucker an even break." I do not seem to be in agreement with the reviewers at IMDB, who regard this as a minor Fields flicker. The ones they cite as superior seem to me to suffer from excessive bitterness and cynicism. This one is sweet almost all the way through, with just enough bitter to make it tangy. A couple of Henry Lawson's poems, set to music. Get out your hankies. Priscilla Herdman sings "Do You Think That I Do Not Know." Sometimes I allude to this as if everyone else knew it, too. If you hear me say "in the days when our hair was brown," I am referring to this. Another: Walter McDonough sings "The Outside Track." No video for this. I looked all over Youtube for a version I liked at least as much as this, but could not find one. Full text here, including some bits that Walter does not sing. I love the phrase, "the last of the careless men." Today, ladies and gents, Victoria Jackson! Do you remember Victoria Jackson from Saturday Night Live? Here she is, to sing for you again. This is a poignant little ditty called "There's a Communist Living in the White House." Let's hear it for Victoria, folks! Speaking of potatoes. It was a big deal when Dan Quayle put an "e" on a potato. And why did he do that? He was "working from an inaccurate flash card prepared by a teacher," that's why. What a situation. Embarrass the teacher? Ask the student to add a letter? He should have embarrassed the teacher, we know that now. But no teacher handed Barack Obama a flash card when he tried to spell "Syracuse" and failed. He did that all on his own. … and I'm hungry! Watch out, potatoes! 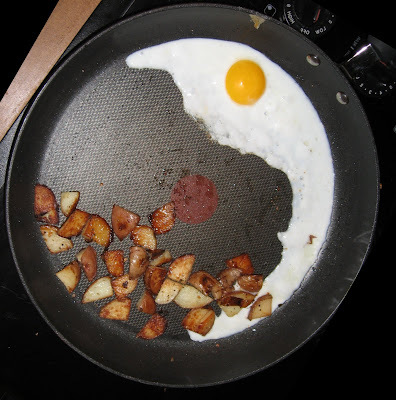 Sort of like the man in the crescent moon, only hungry. Looking at those taters with that big yellow eye, mouth wide open. You see it or you don't. An actual BS detector that rings an alarm bell. He calls it the "crap alarm." Here it is in action, applied to Obama speaking. Oh, did I need to say more? Speaking about his "health care reform." Which, as you no doubt recall, has nothing to do with health care, but much to do with insurance, and the IRS, which is going to withhold the refunds of people who do not comply with its unConstitutional mandate. I must look up Klavan's books, one of these days. "It's life, but not as we know it, Jim!" "There are more things in Heaven and earth …"
Deep under the Mediterranean Sea small animals have been discovered that live their entire lives without oxygen and surrounded by 'poisonous' sulphides. Researchers writing in the open access journal BMC Biology report the existence of multicellular organisms (new members of the group Loricifera), showing that they are alive, metabolically active, and apparently reproducing in spite of a complete absence of oxygen. Rand Simberg says, "Pretty cool. What does this say about prospects for extraterrestrial life?" This month's Analog has a related story, "At Last the Sun" by Richard Foss. It must have been written before this discovery was announced. Update: Author Richard Foss has stopped by to comment that he did indeed write the story months before the discovery was announced. It's a good 'un, so go ye forth and buy that Analog. The Road to Serfdom, that is. One of the necessary books. At Amazon in text, or on the web, illustrated and condensed. John Stossel discussed it for an hour — television hour, that is, about 44 minutes. UK Libertarian has the whole thing, in parts. Do you see that knurled cap on the bottom? It's made of some kind of soft plastic that mold loves to grow on. 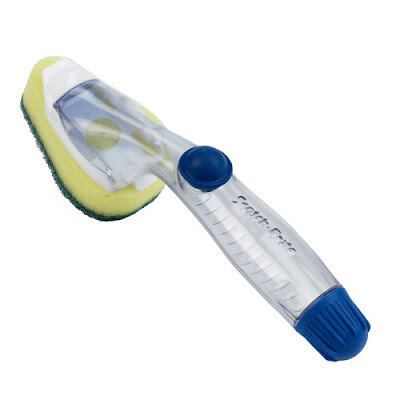 This pic is of a Scotch-Brite dishwand, but I have seen the same thing marketed under the O-Cel-O name, also. (Both from 3M, so no surprise there.) It never occurred to me that mold would be growing on plastic. Replaced it with another brand with a hard plastic endcap, and no more mold stink in the sink. I dropped that egg in the middle of the skillet. It did not stay there. If you do omelets the right way, with the back-and-forth shake to distribute the egg, this warp produces voids in the middle, so that you have to turn the skillet so far on its side that you risk spilling the whole thing on the cooktop. The next big, shallow skillet will not be a T-fal. Disclaimer: I have not been paid in cash or in kind to endorse these products.